The 1 August 2018 deadline covers the observing period 23 January 2019 through 14 October 2019 (Semester 2019A), corresponding to the B and A configurations of the VLA. Multi-configuration proposals that include this configuration may also be submitted. Additionally, proposals requesting only configurations that will fall in semester 2019B (or later) may be submitted if the Principal Investigator is a graduate student. NRAO offers this service to provide scientific and technical feedback for students, and to provide them with an opportunity to re-submit their proposals for their principal semester with this information in hand. Students should ensure that their status is up to date and correct in the NRAO User Database. Please refer to the VLA Configuration Plans for details and availability of upcoming configurations. Note that semester 2016A was the last semester NRAO offered any hybrid configuration. Proposers with very southern or northern targets should consult the Array Configurations section of the Guide to Proposing for the VLA on how to combine principal configurations to obtain similar surface brightness sensitivity to the hybrids. Plots of estimated available observing hours as a function of LST and weather conditions for the A and B configurations in semester 2019A are below. In these plots, engineering, maintenance, and testing cause the solid (upper) line to be less than the total number of LST days in the configuration; such activities occur predominantly during daytime. 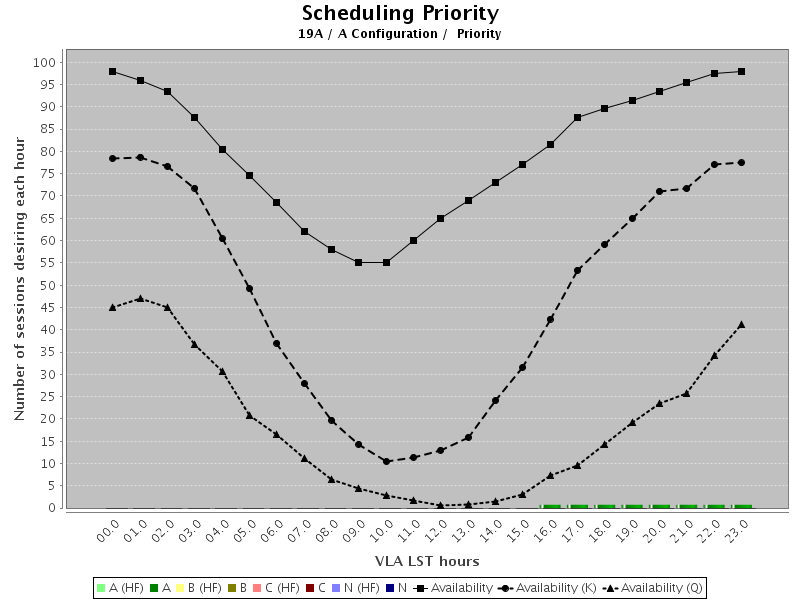 In addition, time for the VLA Sky Survey (VLASS) has already been subtracted from the availability curves for the B-configuration. Estimated science time available per LST hour is shown by the solid (upper) black line for all frequencies, the dashed (middle) line for K-band conditions, and dotted (lower) line for Q-band conditions. 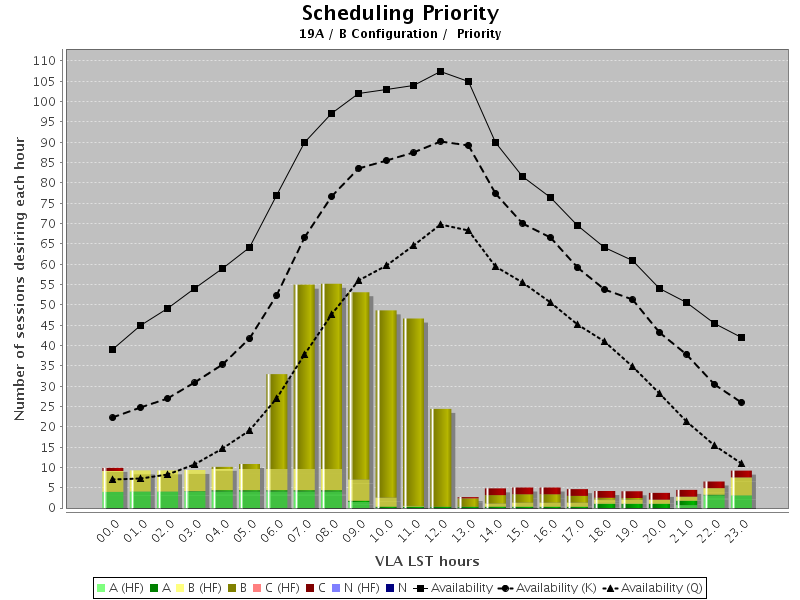 The colored bars show time already committed in previous proposal rounds, where green represents priority A, yellow priority B, and red priority C. For the net available time in either configuration per LST hour subtract the bars of the pre-committed time from the black curve. For the 2019A observing semester, we have added the following capabilities to our General Observing (GO) program: solar observing, P-band spectroscopy, and OTF observing for C-band and lower frequencies. Details are given in the Offered VLA Capabilities during the Next Semester section of the Observational Status Summary (OSS) and are summarized in the following table. Several additional capabilities are available to proposers through the Shared Risk Observing (SRO) and Resident Shared Risk Observing (RSRO) programs, as described below. Both single pointing and mosaics with discrete, multiple field centers will be supported. Data rates up to 25 MB/s (90 GB/hour) will be available to all users and, with additional justification, data rates up to 60 MB/s (216 GB/hour) will be available. Correlator integration time limits per band and per array configuration also apply as described in the OSS. The data rate and total data volume required by a proposal will be a consideration in its technical evaluation. There are some limitations on frequency settings and tuning ranges, especially at Ka-band; please consult the OSS for further details. Additionally, the Exposure Calculator has been updated and other special tools are available to assist users with the development of correlator setups for the proposal deadline (see VLA Proposal Submission Guidelines). All antennas employ electronics and receiver systems that provide continuous frequency coverage from 1–50 GHz in the following observing bands: 1–2 GHz (L-band); 2–4 GHz (S-band); 4–8 GHz (C-band); 8–12 GHz (X-band); 12–18 GHz (Ku-band); 18–26.5 GHz (K-band); 26.5–40 GHz (Ka-band); and 40–50 GHz (Q-band). In addition to these, all VLA antennas are equipped with 224-480 MHz (P-band) and 54-86 (4-band) receivers near the prime focus. For details see the Low Frequency Observing section below. We continue to offer shared risk programs to our user community for those who would like to push the capabilities of the VLA beyond those offered for general use. Frequency averaging by a factor of 2 or 4. See the VLA Proposal Submission Guidelines web page for information about tools and other advice on proposing for Shared Risk observing capabilities. complex phased array observations (e.g., pulsar and complex VLBI observing modes). A detailed description of the VLA RSRO program for semester 2019A and beyond is available at the VLA Proposal Submission Guidelines web page. The new low frequency receiver system developed in collaboration with the Naval Research Laboratory is available for observations at P-band (224–480 MHz) through the GO and SRO programs. Use of the P-band system for polarimetry is through the RSRO Program. The new receivers also work at 4-band (54–86 MHz), and new feeds will have been deployed on all VLA antennas by the time of the 2019A semester. Both 4-band and P-band can be observed simultaneously, but access to the 4-band system is only available through the RSRO program. There are two commensal systems on the VLA that may take data at the same time as your proposed observation. The first is the VLITE system, which will take data at P-band during regular observations that use bands other than P-band. The VLITE system is deployed on fifteen VLA antennas. Observers wishing to gain access to the commensal VLITE data taken during their VLA observations should follow the instructions on the VLITE web page for doing so. The second is the realfast system, which takes data at very fast dump rates in an effort to detect Fast Radio Bursts (FRBs). This system is still in development, but will be observing during the 2019A semester. Proposal preparation and submission are via the Proposal Submission Tool (PST) at NRAO Interactive Services. Use of the PST requires registration in the NRAO User Database. There are various tools and documentation to help users in this process. Descriptions of all updated documentation and tools, along with an outline of the steps required to write a proposal, are available at the Guide to Proposing for the VLA web page. When constructing sessions in the PST, proposers should be cognizant of their use by the Time Allocation Committee (TAC). Specifically taking into account the time available as a function of LST, software will assign an initial scheduling priority to each session in each proposal, which can be modified by the TAC if they desire. The assigned scheduling priority will depend on the linear-rank score of the proposal from its scientific review, the LSTs involved in the session (daytime is harder to accommodate than nighttime, for instance), the predicted atmospheric conditions for observing over that LST range at the time of year of the configuration, the total time requested in the session, and the competition from other proposals requesting time at similar LSTs. Please see this description for guidance on how to set up sessions in the PST, and this document for a complete description of the VLA Prioritizer (the software that generates the initial scheduling priorities for all sessions that are subsequently used by the TAC to derive the final priorities). All approved VLA observations are set up using the Observation Preparation Tool (OPT). Most, if not all, projects will be observed dynamically; users should submit scheduling blocks before the start of the configuration to maximize the opportunity of them being observed. Advice on the optimal length of scheduling blocks and other useful information may be found at the Observing FAQ web page. Information about VLA capabilities, proposal preparation and submission, observing strategies, and calibration overhead can be found in the VLA Observational Status Summary, at the Guide to Proposing for the VLA, and at the Guide to Observing with the VLA. Answers to Frequently Asked Questions are contained in these proposing and observing guides. Questions may also be directed to the NRAO Helpdesk.